If you’re anything like me there are many reason. Cooking is a chance to be creative and make things, it’s a way to relax and unwind, it’s fun and it’s a way to nurture my family and friends And of course it can be an excellent source of compliments. While most people say nice things when someone cooks for them, there’s nothing like the feeling of your guests being genuinely excited about something you’ve made. I love when it happens so I thought I’d share a few tips to help your cooking go from polite thankyous to rave reviews and possibly proposals of marriage. If you have any sure fired tips I’d love to hear them in the comments. Basic stuff right – first you need to find someone to cook for and then actually get busy in the kitchen. I find that people are always happy to talk about their favourite food. Make a point of taking the time to ask and then try and remember the answers. I haven’t yet gone to the extreme of taking notes – but this may not be a bad idea. I remember reading something about a couple that loved to entertain and kept a diary of what they served and to whom so they wouldn’t repeat. The easiest way to get rave reviews is give the people what they love. So if I’m cooking for Colette there’s always chocolate on the menu, for Juanita – zucchini and if I’m trying to impress my brother it’s my Mum’s lemon meringue pie. I believe that beginner’s luck applies in the kitchen. I can’t tell you the amount of times I’ve made something and it’s been perfect the first time and then a disaster when I’ve tried it again. I think it’s because I tend to concentrate harder when I’m out of my comfort zone so there are less silly mistakes. I’ve also found there is more kudos when you casually drop that it’s the first time you’ve made a souffle or whatever into the dinner conversation. You’re probably already doing this but if something is really well received, don’t be afraid to keep it on high rotation. There’s a reason why some dishes become greatest hits and others just fade away. Recently I was cooking steak for my Dad and brother. If it was just me I would have served it alone with some sauteed zucchini, but I didn’t think the boys would go for that so put a simple potato bake on the menu as well. Surprisingly while the steak and spuds were well received, the highest praise (“very yummy”) was reserved for the zucchini. Now I’m not suggesting you be deceptive here, but over my years working in the food industry I’ve experienced the power of suggestion first hand. If you tell someone that the stew got burnt on the bottom they will without a doubt taste some smokiness. But without prior knowledge it’s unlikely that someone will notice little faults. 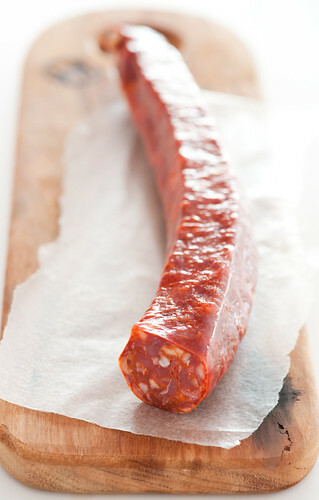 I hate to make sweeping generalisations, but I’m yet to meet a pork eating bloke who doesn’t get excited about chorizo. Ladies (and gentlemen for that matter), if you’re ever looking to get a guy excited about your cooking, this is the dish to do it. To be fair I’m yet to actually test the seduction powers of this dish myself – but I have made it for some male members of my family and got rave reviews. If you had more time, you could substitute in some boiled kipfler potatoes for the chickpeas. Most cooks (myself included in the past) recommend cooking dried chickpeas from scratch rather than using canned but to be honest, I often undercook dried chickpeas. And I’d much prefer canned chickpeas to undercooked dried ones – no more guilt about using canned chickpeas. Preheat a frying pan with 2 tablespoons olive oil on high. Stir fry chorizo until nicely brown on both sides. Stir through chickpeas & paprika and cook for another minute or 2. Taste, season, and stir through tomato and parsley. I was talking to a friend a while back and she made some slightly sarcastic comment about someone she knew who kept a diary of what she’d fed people and when.. at my slightly guilty silence she started laughing as I went to the bookshelf to get my own notebook.. but it DOES help (even when I realised I’d served cabbage three times in a row to one lot of friends – all different recipes, but still..). My biggest recipe for success though is along the lines of “never knowingly undercatered” (which I think was Nigella Lawson). Generous platters of a few dishes rather than lots of tiny ones helps too I reckon. Partly cause people see the generosity, but also cause I’m usually far less stressed! My grandmother’s rule, which falls in line with your last one, is “never apologise”. If you are cooking for someone, that in itself is enough, without drawing attention to your shortcomings or errors. Guests should be appropriately grateful at being cooked for, and your job as host is to let them enjoy the evening without constantly looking for reasssurance or apologising for real or imagined shortcomings. I have never felt worse about my cooking than when I recently served my friend, who has come to expect yummy things of me, undercooked and sub-standard steak. Simpy horrific. I think an important part of cooking for those you love is to share your skills. While said friend more often than not nominates me to cook for our catch-ups, last time I offered to make some pizza bases, to which she added the toppings, and stuck in the oven. Accolades for everyone! Oh, and I just ate these ingredients — with the boiled baby chats, not chickpeas — in a frittata. Delish. Hello. I just popped over to say I received your book in the mail today. I have just put it down and I just wanted to say that your love for your mum well and truly came through. I really liked your stories and if I had to choose a recipe to make right now it would either be her sponge cake or the piklets. None of my recipe books contain a simple piklet recipe believe it or not so that is great. Actually I am finding a lot of these recipes would suit my eldest daughter who is learning to cook at the ripe old age of 23, so I shall be passing it on to her. Nice work and I am sure it won’t be your last book. I love the last comment- no disclaimers ever. Most of the time no one will notice unless the mistake is thoroughly awful. I made pork cutlets for a party once and overcooked them. I couldn’t believe how many people exclaimed over how good they were, and I just sat and kept my mouth shut. To me, they tasted like leather. But we don’t know, nor should we care what others taste, as it’s always different. One piece of advice I’ve had to learn how to utilize is that if someone asks if they can bring something to a party, say ‘Yes’ and then give them a suggestion. Leave it up to them how it’s interpreted, but never let a chance pass for someone to help out, and that includes in the meal itself. People love to get involved. They love to help. Don’t be selfish and wave away the offers. Hand them a spoon, a hot mitt or a timer. Let them put the snacks out, pour drinks or rinse dishes. Part of the fun of having guests over is that they become an extension of your home and all it’s happenings. We had 30 minutes to shop on the way in from the airport – after catching a flight that required me to get up at 3 am…. so, I was feeling kinda fried by the time we got the supermarket. Upon arriving at our condo in the middle of nowhere, with no easy transportation to any place the resembled a supermarket I had to “make do”. Because the beef broth couldn’t be homemade, and it didn’t get purchased at the store a package of oodles of noodles soup was the base for stew one night. No one noticed and I wasn’t telling. Although I grinned to myself as bowls were licked clean. I had purchased egg beaters to use for brownies and corn bread….. later in the week, in trying to use up the leftovers I made myself some “eggs” only to discover they were mexican style – with peppers and onions. Which I can see being OK in the corn bread, but how did no one notice them in the brownies!!!??? Great post! I especially love that recipe – oooh, looks sooo good! this post hit the spot for me. My in-laws are coming in town next week for the babies’ birthday and I need something amazing to cook for them and for the babies. They are not very picky with most dishes but the only difficult part is desert. My father-in-law and my husband love only one desert – the chocolate cake that my mother-in-law fixes but I am so tired of it. (It is one of those easy cake-mix recipes). I’ve been looking everywhere to find the best chocolate cake recipe that would be delicious but at the same time fool-proof (I am horrible with baking :-( ). Do you have any ideas? This is a great post, thanks! I agree with your point about beginner’s luck. I always try something new when I have people over, and guests always know that there is a possibility that it might all go wrong and they will be served chinese take-away. Luckily this has never happened to me. Kate, I agree with you that people love to help. It’s good to give them something to bring. However, last Christmas, I told everybody to please bring ice, and nobody did! I’ll have to ask for something easier next time. you wouldn’t believe the amount of times I’ve been in meetings and got people to taste things ‘blind – not knowing what the difference was between 2 samples and no one could pick the difference whereas I thought it was completely obvious. love you’re work – can’t believe I haven’t thought of this myself – choosing an appreciative audience is half the battle. although to be fair – I also find that chefs and people who usually don’t get cooked for are very sympathetic audiences. sounds like your grandmother is very wise. you’re lucky. I don’t have any grandparents left – maybe I should try and adopt yours. thankyou so much for your kind words. am glad your daughter will get some use out of the book as well. and the pikelets are the goods I need to makes some soon. couldn’t agree with you more – getting people to help and feel included is what it’s all about for sure. i love your spirit. nothing like having to make do to inspire inventiveness. we don’t have mexican eggs here but I can’t imagine how noone noticed the pepper and onion in the brownies – I’m wondering if they made the brownies better? – I mean onion makes most things taste better. first thought would be to try the brownies I posted about recently. otherwise there’s a jamie oliver based chocolate hazelnut cake I posted about ages ago. you’re going to need to separate eggs and whip the whites but apart from that it’s very forgiving – the nuts keep it lovely and moist. the recipe I posted is for a huge cake so remember to halve it for a 24cm (10in) round cake tin. https://thestonesoup.com/blog/2008/06/party-party/ let me know how you get on. I also find that if you casually mention it’s your first time making the dish, people tend to be more forgiving as well as more impressed. They might also offer suggestions for next time – which some people find annoying, but I love! In the kitchen I think I have trouble controlling myself. I usually cook too much–smaller quantities probably cook better, so I have to get into the discipline of cooking less, more often. I’m of Indian heritage and would love to see your Indian vegetarian recipes, if you do that. yum…looks really sumptuous..maybe you should consider advertising your recipes to increase popularity same with game advertising online..your recipes really rock! 4 – trying new things – I have discovered that although I don’t often make the same thing twice I am often picking from past experiences like a magpie – so although I would recommend trying new things I would also say that one way to feel more comfortable about it is to build on other successes. 7 – no apologies – I think that often if you don’t tell people something was a mistake they think you are just being clever – for example if you don’t mention that you burnt it, people might admire the smoky taste! I love Indian but don’t cook it that often. will try and get some vego indian recipes on the agenda. Two things for me – don’t try too hard and cook something I love to eat. When I try too hard to please or impress, I end up with a bit of a disaster. I produce much better results when I am relaxed and just throw something together. I need to love (be able to taste in my mind) the food I am cooking. If I try to modify something too much to suit my guests tastes, then it does not work – I am better off cooking something completely different that works for them. For example with cooking Indian food, if I try and really dumb down the spices, etc, it doesn’t work. If people can’t eat spicy food then I just make something really different – like French food. They can go and experiment with “indian for beginers” somewhere else, not in my kitchen! I know that sounds a bit bolshie, but if there is no passion in it, the food is a disaster. The problem with this is that you should be more specific on the chorizo. My gf and I went to the store for this (i’m hispanic, she’s not) and we had an argument on the chrorizo. I suggested that we use something else because the type of chorizo i’m used to getting here, the only thing that is real chorizo is too fatty to firm like sausage. We’ll she won and we cooked with that chorizo. Now we got chili mixed in with the chickpeas, etc. If I’m cooking something for the first time, usually trying it on my man, I want some feedback. But if you just ask how it was, the answer is always “it was delicious!”. I usually throw something in like “yeah I really liked it, but I wonder if next time I might use a bit less sugar, or replace it with some grated apple…” etc etc. That way it opens the floor for constructive advice. 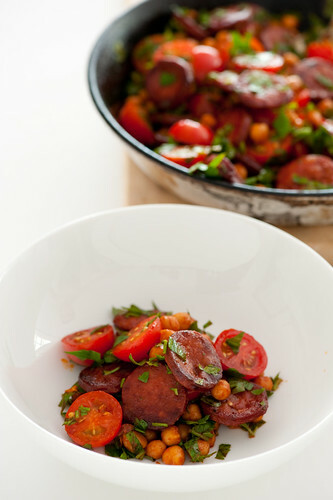 That chorizo dish looks phenomenal! Thanks for posting! I tend to make a dish that I’m curious about. I get all excited while I do my research and then get crazy in the kitchen. I have the most fun that way, and it comes through in the food. Hi Jules – I found your blog through your article on Zen Habits. The idea of five-ingredient/10-minute recipes intrigued me, as I don’t love to spend a lot of time in the kitchen. I chose this as the first recipe of yours I made, as I had pretty much all the ingredients (we love us some smoked pork products in this house!) It turned out wonderful – very filling! Next time I make it, I might try swapping in cilantro instead of the parsley, as I think I’d prefer the flavor. I think it’s a great idea to keep the negative points on the down low when you are talkin about your food.. stuff like, ” I think I kept it in too long so the cheese might be a little crispy” are things that the average joe would probably not even pay attention to had you not mentioned it. I like to ask for feedback a few days later, instead of while they are eating, as most people won’t just outright say something they don’t like AS they are chewing… Kudos. I love the look of your dish – and I just know it will be divine – however I don’t know how to serve it – I would normally do something else with it – but what? – salad does not seem right. 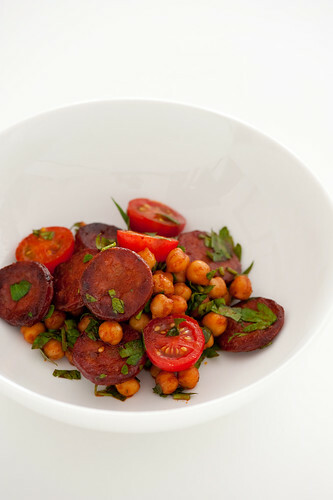 (the chorizo and chick peas). I love chick peas!! it’s one of those things that’s pretty much designed to be served on it’s own. But if you wanted some greens I think a salad would be fine. Maybe something a bit more substantial like a tabouleh.